This article is about a famous phrase. For other uses, see The Pursuit of Happiness. "Life, Liberty and the pursuit of Happiness" is a well-known phrase in the United States Declaration of Independence. The phrase gives three examples of the "unalienable rights" which the Declaration says have been given to all humans by their creator, and which governments are created to protect. ✪ Thomas Jefferson — "Life, Liberty, and the Pursuit of Happiness"
Man 1: "We hold these truths to be self-evident, "that all men are created equal, "that they are endowed by their Creator "with certain unalienable Rights, that among these are "Life, Liberty, and the pursuit of Happiness." It's this amazing second sentence of the Declaration of Independence that Jefferson and Adams and Franklin wrote as part of a committee and we were looking at that sentence. Let's go on to look at that phrase, "they are endowed "by their Creator." It's interesting, they don't really mention Jesus Christ and not even God. They talk about the laws of nature and of nature's god and a creator. These are deists, people who believe in the notion that there's some grand creator of the universe, but they don't get into the specifics of any particular religious dogma. The other thing is they're balancing where do our rights come from? In an earlier draft, and we'll talk about how they edit the earlier drafts in a later video, but in an earlier draft it just says they're endowed with certain unalienable rights and you see that John Adams, probably, is the one who wants to insert the phrase "their Creator" and that was because they started the sentence with "We hold these truths to be sacred," but they changed that to "self-evident." They're trying to say to what extent is it rationality that gives us these rights, to what extent are these rights endowed by God and I think what they finally come down to is that we all had a creator and that creator made us all. So, to a certain sync, we're created equal. Our creator must love us all, we are all created by the same creator, therefore there's a certain equality that we have and in creating us, he gave us certain unalienable rights. Man 2: Unalienable just means can't be taken away. It can't be separated. Man 1: It can't be separated. You can't take these rights away. The king can't take these rights away. In other words, it's not as if we could give up these rights and in particular, they are talking about this theory of government that John Locke had, who was one of the philosophers that they read, an English philosopher of that period, who said that when you created government or there is a government, you give up some of your rights. For example, if we all agree that we're part of a government, we may give up our right to take somebody else's property or whatever it may be. These are rights you can give up, but there are certain rights that are unalienable, that you just can't give up or the king can't take it away. Once again, you've got to look at Thomas Jefferson, who actually owned slaves at this point and he's saying among those unalienable rights are life, liberty, and the pursuit of happiness. There's this inherent conflict still, between rights, such as liberty, that you can't take away from a person and yet, Jefferson's writing this phrase when he owns slaves. The phrase "Life, Liberty, and the pursuit of Happiness" is also something that derives from John Locke and these philosophers of the Enlightenment that were writing in England. At one point, John Locke uses the phrase "Life, Liberty, "and the pursuit of property," because Locke believed that owning property was an important right you had and the government couldn't just take your property away. However, you can see that they change it to a more elevated phrase (laughter) that we each get to pursue our own notion of what we want to do in our lives, our happiness. I don't think they just mean happiness like joy and frivolity. I think they mean pursuit of meaning in life, what gives our life meaning and these are the unalienable rights. Then they go on and this gets to what's called the contract notion of government, is that why do we have governments? Whether it's John Locke or the other philosophers we've talked about, they say the reason we have government is that we all had these rights, but we decided to get together. We instituted governments. Governments are instituted and the reason those governments have their power is because of the consent of the governed. It's like if you and I and 20 people got together and formed a group and we said, "We're going to form "a group, we'll give up some of our rights, "because the group itself will have certain powers, "but we're consenting to do that." It's not because of the divine right of kings. It's the consent of the governed. The consent of the people says we will institute a government amongst ourselves and that's not to take away our rights, that's to secure our rights. Man 2: Right. I might ... The 20 of us might give up our right to enforce things, police each other, to the government, so that we could have our life, liberty, and pursuit of happiness. We're more likely to have it secured. Man 1: Once you get to that theory, you have to say, "What are the type of rights we would give up?" Such as, maybe, the right to decide the traffic laws or the policing of the thing, or how property contracts are made, but there are certain things that, no matter what you did, if you were instituting a government among men, you would not give up the right to life, you would not give up the right to liberty, and you would not say, "I'm going to give up "my right to pursue my own life ends, "my own happiness." You would say, "We want to secure those rights. "We're not going to give those up to government." The United States Declaration of Independence was drafted by Thomas Jefferson, and then edited by the Committee of Five, which consisted of Jefferson, John Adams, Benjamin Franklin, Roger Sherman, and Robert Livingston. It was then further edited and adopted by the Committee of the Whole of the Second Continental Congress on July 4, 1776. The second paragraph of the first article in the Declaration of Independence contains the phrase "Life, Liberty and the pursuit of Happiness". In 1689, Locke argued in his Two Treatises of Government that political society existed for the sake of protecting "property", which he defined as a person's "life, liberty, and estate". In A Letter Concerning Toleration, he wrote that the magistrate's power was limited to preserving a person's "civil interest", which he described as "life, liberty, health, and indolency of body; and the possession of outward things". He declared in his Essay Concerning Human Understanding that "the highest perfection of intellectual nature lies in a careful and constant pursuit of true and solid happiness". According to those scholars who saw the root of Jefferson's thought in Locke's doctrine, Jefferson replaced "estate" with "the pursuit of happiness", although this does not mean that Jefferson meant the "pursuit of happiness" to refer primarily or exclusively to property. Under such an assumption, the Declaration of Independence would declare that government existed primarily for the reasons Locke gave, and some have extended that line of thinking to support a conception of limited government. The first and second article of the Virginia Declaration of Rights, written by George Mason and adopted unanimously by the Virginia Convention of Delegates on June 12, 1776, speaks of happiness in the context of recognizably Lockean rights and is paradigmatic of the way in which "the fundamental natural rights of mankind" were expressed at the time. Benjamin Franklin was in agreement with Thomas Jefferson in playing down protection of "property" as a goal of government. It is noted that Franklin found property to be a "creature of society" and thus, he believed that it should be taxed as a way to finance civil society. In 1628, Sir Edward Coke wrote in The First Part of the Institutes of the Lawes of England, his commentary on Thomas de Littleton, that "It is commonly said that three things be favoured in Law, Life, Liberty, Dower." At common law, dower was closely guarded as a means by which the widow and orphan of a deceased landowner could keep their real property. If, in reality, courage and a heart devoted to the good of mankind are the constituents of human felicity, the kindness which is done infers a happiness in the person from whom it proceeds, not in him on whom it is bestowed; and the greatest good which men possessed of fortitude and generosity can procure to their fellow creatures is a participation of this happy character. If this be the good of the individual, it is likewise that of mankind; and virtue no longer imposes a task by which we are obliged to bestow upon others that good from which we ourselves refrain; but supposes, in the highest degree, as possessed by ourselves, that state of felicity which we are required to promote in the world. The 17th-century cleric and philosopher Richard Cumberland wrote that promoting the well-being of our fellow humans is essential to the "pursuit of our own happiness". Locke never associated natural rights with happiness, but his philosophical opponent Gottfried Wilhelm Leibniz made such an association in the introduction to his Codex Iuris Gentium. William Wollaston's The Religion of Nature Delineated describes the "truest definition" of "natural religion" as being "The pursuit of happiness by the practice of reason and truth". An English translation of Jean-Jacques Burlamaqui's Principles of Natural and Politic Law prepared in 1763 extolled the "noble pursuit" of "true and solid happiness" in the opening chapter discussing natural rights. Historian Jack Rakove posits Burlamaqui as the inspiration for Jefferson's phrase. Other tripartite mottos include "liberté, égalité, fraternité" (liberty, equality, fraternity) in France; "Einigkeit und Recht und Freiheit" (unity, justice and liberty) in Germany and "peace, order, and good government" in Canada. It is also similar to a line in the Canadian Charter of Rights: "life, liberty, security of the person" (this line was also in the older Canadian Bill of Rights, which added "enjoyment of property" to the list). The phrase can also be found in Chapter III, Article 13 of the 1947 Constitution of Japan, and in President Ho Chi Minh's 1945 declaration of independence of the Democratic Republic of Vietnam. An alternative phrase "life, liberty, and property", is found in the Declaration of Colonial Rights, a resolution of the First Continental Congress. The Fifth Amendment and Fourteenth Amendment to the United States Constitution declare that governments cannot deprive any person of "life, liberty, or property" without due process of law. Also, Article 3 of the Universal Declaration of Human Rights reads, "Everyone has the right to life, liberty, and security of person". ^ "The Declaration of Independence: Rough Draft". USHistory.org. Archived from the original on March 30, 2014. Retrieved May 18, 2014. Scanned image of the Jefferson's "original Rough draught" of the Declaration of Independence, written in June 1776, including all the changes made later by John Adams, Benjamin Franklin and other members of the committee, and by Congress. ^ Rakove, Jack N. (2009). The Annotated U.S. Constitution and Declaration of Independence. Cambridge: Belknap Press of Harvard University Press. pp. 7–22. ISBN 0674036069. ^ Dube, Ann Marie (May 1996). "The Declaration of Independence". A Multitude of Amendments, Alterations and Additions. Pennsylvania: U.S. National Park Service. OCLC 44638441. ^ "We Hold These Truths To Be Self Evident..." U.S. Library of Congress. Retrieved October 29, 2013. ^ Boyd, Julian P., ed. (1950). The Papers of Thomas Jefferson. Volume 1: 1760–1776. Princeton: Princeton University Press. pp. 243–47. OCLC 16353926. 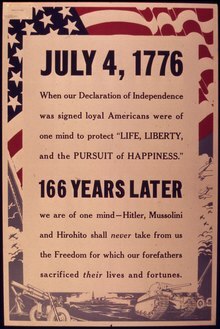 ^ "Declaration of Independence". U.S. National Archives. Retrieved May 19, 2013. ^ Fountain, Ben (September 17, 2016). "Two American Dreams: how a dumbed-down nation lost sight of a great idea". The Guardian. Retrieved January 21, 2017. ^ Shannon, Timothy J. (July 4, 2016). "What About That Pursuit of Happiness?". Philly.com via Gettysburg College. Retrieved January 21, 2017. ^ Locke, John (1988) . Laslett, Peter, ed. Two Treatises of Government. Cambridge, NY: Cambridge University Press. Sec. 87, 123, 209, 222. ISBN 052135448X. ^ Locke, John (1983) . Tully, James H., ed. A Letter Concerning Toleration. Indianapolis, IN: Hackett Publishing. p. 26. ISBN 091514560X. ^ Locke, John (1975) . Nidditch, Peter H., ed. Essay Concerning Human Understanding. Oxford, UK: Clarendon Press. Book 2, Chapter 21, Section 51. ISBN 0198245955. ^ Zuckert, Michael P. (1996). The Natural Rights Republic. Notre Dame, IN: University of Notre Dame Press. pp. 73–85. ISBN 0268014809. ^ Corbett, Ross J. (2009). The Lockean Commonwealth. Albany, NY: State University of New York Press. ISBN 1438427948. ^ Pangle, Thomas L. (1988). The Spirit of Modern Republicanism. Chicago, IL: University of Chicago Press. ISBN 0226645401. ^ Gibson, Alan (2009). Interpreting the Founding (2nd ed.). Lawrence, KS: University Press of Kansas. ISBN 0700617051. ^ Rahe, Paul A. (1994) . Republics Ancient & Modern, Volume 3; Inventions of Prudence: Constituting the American Regime. Chapel Hill, NC: University of North Carolina Press. pp. 13–19. ISBN 080784473X. ^ Rakove, Jack N. (2009). The Annotated U.S. Constitution and Declaration of Independence. Cambridge, MA: Belknap Press of Harvard University Press. p. 78. ISBN 0674036069. ^ Banning, Lance (1995). Jefferson & Madison. New York, NY: Rowman & Littlefield. pp. 17, 103–04. ISBN 0945612486. Lance Banning notes that the Virginia Declaration of Rights was the inspiration for the phrase in the Declaration of Independence, but does not trace it back to Locke, and in general downplays Jefferson's debts to Locke. ^ "The Virginia Declaration of Rights". U.S. National Archives. Retrieved May 19, 2013. ^ Franklin, Benjamin (2006). Skousen, Mark, ed. The Compleated Autobiography. Washington, D.C.: Regnery Publishing. p. 413. ISBN 0-89526-033-6. ^ Coke, Edward (1628). The First Part of the Institutes of the Lawes of England. London: Adam Islip. Section 193. OCLC 84760833. ^ Whitehead, Edward Jenkins (1922). The Law of Real Property in Illinois. 1. Chicago: Burdette J. Smith & Company. p. 178. OCLC 60731472. ^ Wills, Gary (2002) . Inventing America: Jefferson's Declaration of Independence. New York, NY: Mariner Books. ISBN 978-0-618-25776-8. ^ Ferguson, Adam (1995) . Oz-Salzberger, Fania, ed. An Essay on the History of Civil Society. Cambridge, NY: Cambridge University Press. pp. 99–100. ISBN 052144215X. ^ Cumberland, Richard (2005) . A Treatise of the Laws of Nature. Indianapolis, IN: Liberty Fund. pp. 523–24. ISBN 0865974721. ^ Leibniz, Gottfried Wilhelm (1988). Riley, Patrick, ed. Leibniz: Political Writings (2nd ed.). Cambridge, NY: Cambridge University Press. p. 171. ISBN 0521353807. ^ Wollaston, William (1759) . The Religion of Nature Delineated (8th ed.). London: Samuel Palmer. p. 90. OCLC 2200588. ^ Burlamaqui, Jean-Jacques (2006) . The Principles of Natural and Politic Law. Indianapolis, IN: Liberty Fund. p. 31. ISBN 0865974969. ^ Rakove, Jack N. (2010). Revolutionaries: A New History of the Invention of America. Boston, MA: Houghton Mifflin Harcourt. p. 300. ISBN 0618267468. ...arguably owed more to Jefferson's reading of the Swiss jurist Jean-Jacques Burlamaqui than it did to his manifest debt to John Locke. ^ Blackstone, William (1765). "Section the Second: Of the Nature of Laws in General". Commentaries on the Laws of England. Clarendon Press. pp. 40–41. OCLC 65350522. ^ Dyck, Perry Rand (2000). Canadian Politics: Critical Approaches (3rd ed.). Scarborough, ON: Nelson Thomson Learning. ISBN 978-0-17-616792-9.